55/55 Reagen Sulewski As bad as you might expect, yet at the same time, it could have been so much worse. Nonesensical and boring. 72/92 David Mumpower "Whoever wins, we lose." Well, I can't say I wasn't warned. 116/126 Kim Hollis Stilted dialogue. Noisy, noisy aliens. But hey, at least there's a love story. After spending years in Development Hell, the long-awaited - in some circles, anyway - pairing of the Giger-inspired Alien and the Schwarzenegger fodder Predator is finally heading to theatre screens. One might be inclined to think the project was greenlighted after 20th Century Fox saw the success New Line had with Freddy vs Jason, but actually the film went into production long before the Nightmare on Elm Street/Friday the 13th hybrid reached audiences. 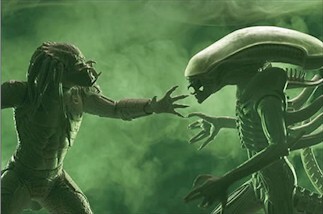 Alien vs Predator is actually prequel rather than sequel, at least to the Alien franchise. As such, Sigourney Weaver’s Lt Ellen Ripley is nowhere to be found. But worry not, oh fans of women-in-jep, for there is indeed a woman for the beasties to menace, in the form of an environmental scientist and mountain climber named Lex Homer. But there will be a direct connection with the Alien franchise in the form of Lance Henriksen, who played both the synthetic Bishop in Aliens and the man who created Bishop and ultimately used Ripley as an incubator in the execrable Alien3. This time around, Henriksen will play industrialist Charles Weyland, who mounts the scientific expedition that results in all the mayhem. There are also assorted red-shirts along, because after all, what’s a long-leggedy beastie movie without lots of folks getting slaughtered in gruesome fashion. The plot, as if that really matters, is based on the premise that once upon a time millennia ago, the Predators used Earth as a training ground for their warriors. They were even worshiped as gods by the Aztecs, who built temples and monuments that were used in the Predators’ training exercises. The Aliens were brought to Earth as bait/prey, until one ran amok and wiped out all the Predators. Why it didn’t wipe out the Aztecs too isn’t a question that is apparently even raised, much less answered, but there you go. Flash-forward to the 21st century, where Weyland has uncovered what he thinks is evidence of a von Däniken-like extraterrestrial civilization underneath the Antarctic icecap. Turns out he’s found an even older temple to the Predator gods than the ones the Aztecs constructed, along with lots of human skeletons with burst ribcages and lots of other human skeletons with fossilized face-huggers on their skulls. And this temple, unfortunately for the expedition, is still active, putting our intrepid scientists/explorers/monster-bait smack in the middle of a Predator hunt for Aliens. As the tagline goes, “Whoever wins, we lose”. A sentiment that may well come back to haunt 20th Century Fox should this flick be a turkey.